Join me on my road trips as I explore the USA! It's been two years in the planning, but I'm finally going. Ever since my Route 66 loop of 2012 (which I promise I'll write up soon), I've been itching to do another long drive in the Southwest. The germ of the idea dates back to 2014, when I wrote about a fantasy route from Dallas to San Francisco. It was "The Loneliest Road" that first caught my attention - 287 miles of nothing across the north of Nevada. I had to do it. Because my trip has to start and end in Dallas, I've extended the route to include a few more iconic drives. I'll be exploring the highs and lows of the Southwest. The searing heat of Death Valley to the Million Dollar Highway winding across the mountains of Colorado. 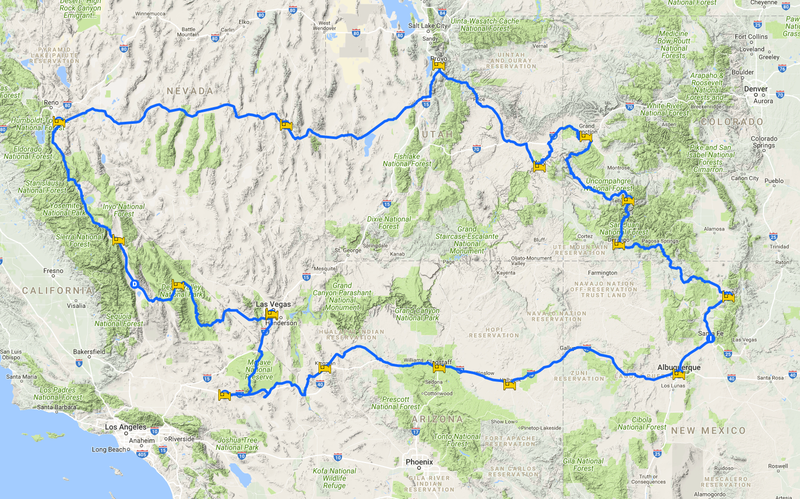 I'll also take in US-395 - the back route across California - plus of course, some Route 66. I'll get a good dose of National Parks - the Arches outside Moab, The National Monument of Colorado and of course, Death Valley. I plan to see Indian Pueblos in Taos and eat 'modern Navajo' in Provo, Utah. I'm going to sleep in a concrete Wigwam and a motel that's not even on the Internet. I don't plan to lose my shirt in Vegas, but I'm definitely going to sample the buffets. Rather than try - and fail - to write all this up when I get back, I plan to blog daily, and then tidy it up later. So please forgive exuberant grammar and copious typos. So, without further ado, here's my blog for my road trip of 2017. I hope you enjoy it.